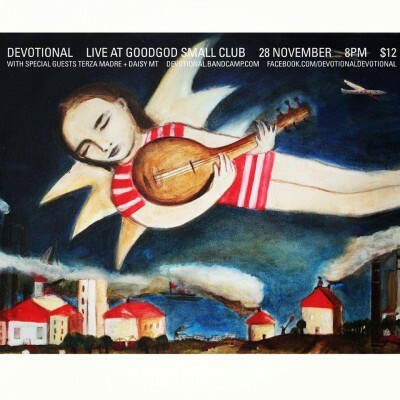 Devotional are teaming up with us to present an evening of decadence, romance and splendour featuring some of the best acts of Sydney’s underground music scene. Performing their first headline show since the launch of their 7″ single My Baby Loves Me All The Time, Devotional are excited to reveal a new line-up featuring Ben James (ex Talons, Songs) on drums, Robert Irish on guitar and vocalist Madelaine Lucas front & centre. Their set will debut new material to be recorded in 2014, and feature guest appearances by some very special friends. Terza Madre are an 8 piece supergroup comprising of members from bands such as Psychonanny and The Babyshakers, Songs, Regular John, Quaoub, Womens Aux Choir and more. They play Italian pop songs from the 60s and 70s IN THE ORIGINAL ITALIAN. Their live sets are extravagant and spell-binding. Former violin slinger for Bridezilla, Daisy’s solo music reveals a stoic strain of dark beauty that is hers alone. Her live sets, combining tender folk songs with violin loops, will break your heart and give you shivers. This will be the first show for Daisy MT in over a year—not to be missed!